In the menu bar, you’ll find some more tools and shortcuts. New – Opens a new project window. If a project window is already open, you’ll be prompted to save the project and then it will close before opening a new project window. Open – Open a saved project. Save – Save the project file. Save As – Save the project with a different name. Recent Files – Choose from the most recently opened files. Save as Default – Saves your project preferences as the default. Reset Default – Resets default preferences. 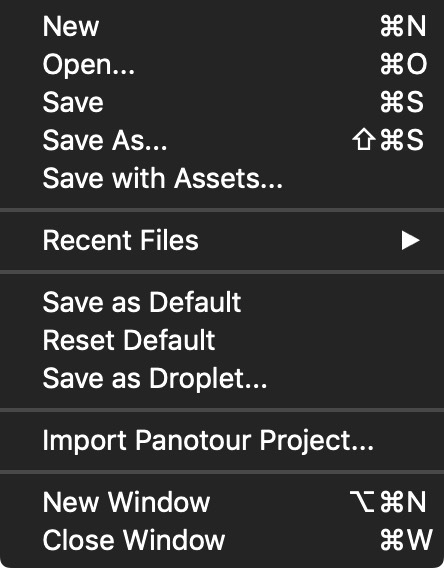 Save as Droplet – Will save your project and preferences as a droplet onto your desktop for quick image batch converting. Skin Editor – Opens the Skin Editor. Panoramic Video Wizard – Opens the Panoramic Video Wizard. Integrated Web Server – Opens the Integrated Web Server for simplified local testing. Animation – Opens the Animation Editor. Undo – Undo last action. Redo – Redo last action. Go to Default View – Sets panorama to its default view. 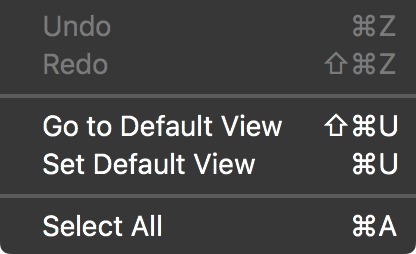 Set Default View – Sets the default view. Select All – Selects all images in the Tour Browser. Next Pano – Go to the next panorama. Previous Pano – Go to the previous panorama. Add Pano – Adds a panorama to the tour. Edit Master Node – Choose this to edit the master node. ★ Images must be geotagged and their directions correctly set for automatic linking to work. Sequential - The panoramas will be linked in their order in the Tour Browser. Closest Node - The panoramas will be linked based on their closest neighbor based on GPS data. ✭ Suggested mode for uploading to Google Street View. Complete - This links each panorama to every other panorama in the tour. Remove All Links - Click to remove all point hotspot types that are a Tour Node. 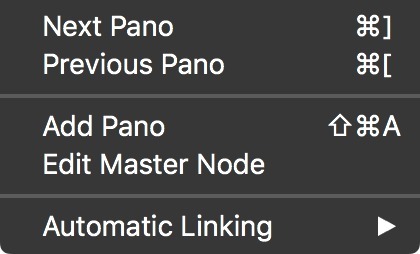 If multiple nodes are selected, the links between them will be removed. This is especially useful for trying out different Automatic Linking methods. Window Arrangements – Saves your window layouts. Hide/Show Panels – Hides or Shows all panels. History – Opens the History panel. List View – Opens a List View of all the elements added to the panorama. Overview – Opens the Overview panel. Properties – Opens the Properties panel. Google Street View – Opens the Google Street View Panel. 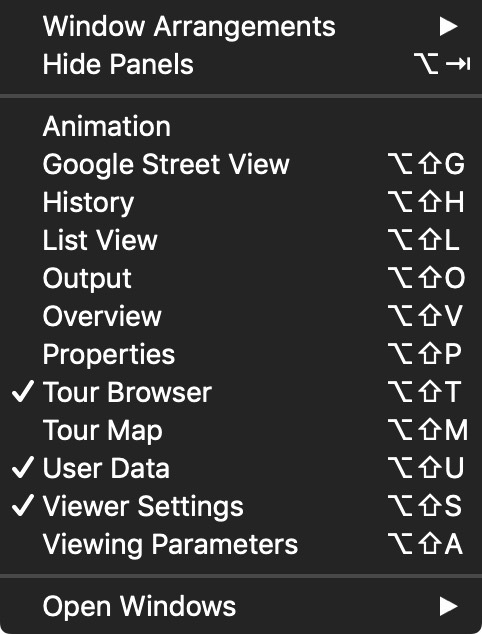 Tour Browser – Opens the Tour Browser panel. Tour Map – Opens the Tour Map panel. User Data – Opens the User Data panel. Viewer Settings – Opens the Viewer Settings panel. Viewing Parameters – Opens the Viewing Parameters panel. Help – Opens the Help pages (documentation). Video Tutorials – Takes you to the video tutorials page. Check for Updates – Choose to check for software updates. Create Support Package – If you require help and need to contact our support team, you can use this to collect all the files the support team would need to help you. Select the files needed, and hit, Create Package. Pano2VR will collect the files and package them in a ZIP, ready for sending to our support team. If you’re unsure what files to send, just stick with the default selection (Screenshot, project file, skin files, system information).